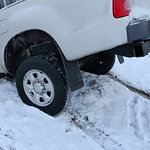 Slick roads could instantly disable any vehicle on the road, and the more desolate the location, the more you need to make your car visible to other motorists to get help quickly. Be sure to have road flares and safety triangles in your kit. A dead battery needs to be jump started to get you rolling again, and the majority of motorists do not have a pair of jumper cables in their trunk. Bringing a pair will ensure the first vehicle that stops will be able to jump your battery. A stranded car may not be running, so you'll need to have a blanket, clothes, gloves, and hats, inside the winter survival kit. Gear up for winter adventures with a new truck from our dealership.